‘Twenty Views of Fragrant Harbour by Lois Conner’ is the latest work in our ongoing consideration, and commemoration, of the British colony> territory> Chinese Special Administrative Region of Hong Kong, 香港, literally ‘fragrant harbour’. See also Cauldron 鼎 and Yau Ma Tei’s Hong Kong Rhapsody. Lois Conner‘s art features in the mastheads both of China Heritage and of China Heritage Annual. Also see A New York Eye on the Rapa and 顛倒 Downside Up — the art of Lois Conner. Note: a mouse-click or finger-tap on an image will open a separate window allowing you to view the photograph in greater detail, and to enlarge it. Hong Kong is where my history with China began in 1984. I traveled there first, before going to the People’s Republic, both to get my bearings and a sense of place in Asia. Its territory is comprised of hundreds of islands (statistically, 261) and peninsulas, bays, seas and mountains. Vertiginous buildings teeter and hover over the landscape; they are often swathed in morning mist. Living and working spaces, trees and lakes, parks and buildings are squeezed into infinitely small areas, to my eye creating a living, malleable collage. This group of photographs is focussed on the territory’s buildings and how they fit into the landscape. I also visualise them as a landscape unto themselves. Most of these tall, steel-framed structures were constructed by workers more assured of their balance in their bare feet who used multi-storied bamboo scaffolding, even for the then tallest building in Asia, I.M. Pei’s Bank of China. These ‘stalagmites’ are integral to, even organically Hong Kong; their glass-panelled façades reflect not only each other in an endless regression, but also the extraordinary mountainous landscape or the sea around them. In order to get around, you can use the seemingly endless steps and steep roadways that meander over Hong Kong Island, as well as elevators, elevated roadways and overpasses that offer another way up, and a different vantage point. Boats, ferries, trams as well as the metro hurry one along or allow you to push far away from the teaming metropolis. Finding my voice in Hong Kong took time. Fortunately, during my first visit, I lived in a tiny hotel on the top two floors of a building in Wanchai, next to its open market. I could touch the walls of my room with my hands outstretched, my window had bars dividing up the landscape into tiny parcels, while the view down to the street was punctuated by twisting wires, lights and jutting balconies. Surrounded by the visual intensity of these and other details, my sense of scale was set ajar. And I’m from New York. Roaming the streets (with my bulky nineteenth-century camera and equipment), exploring rooftops and the interiors of the buildings around me as though I was on a trek in the mountains, I was guided by jostling signs most of which were in a language I still didn’t understand, as well as by the new sights and smells that assailed my senses. And then there was the serendipity of rounding a corner and finding the unexpected, or unfathomable. Originally, I had naïvely assumed that the landscape of Hong Kong might somehow resemble that of China. It couldn’t have been more different. Every year after that, I would first stay in Hong Kong on my way to China: to get my bearings and a dose of its heady worldliness, but also so I could take the train to Guangzhou, then west to the megalithic limestone formations of Guilin. The streets of Hong Kong were full of tourists, merchants, locals, students and shoppers from all over Asia, Europe and Africa. Sherpa’s with knives dangling from their belts, turbaned Sheiks and Princes mixed with Cambodians and Mongolians, and seemingly every nationality — energized in an atmosphere of mercantile abandon. The Himalayas didn’t feel too distant, and the sea around us swelled with massive cargo ships, a navy promising constant renewal to a place that thrived as an oculus of world trade. 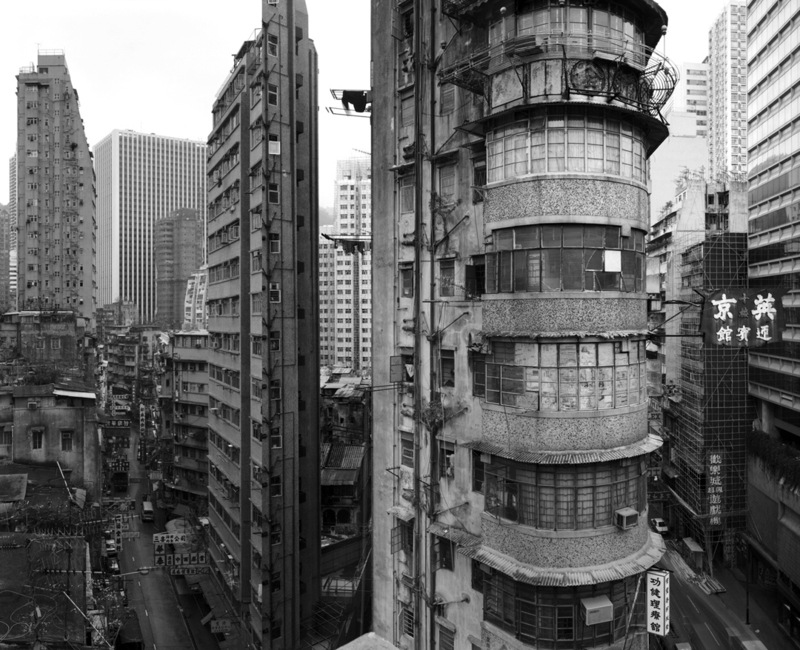 Over the years, the varied landscapes and atmosphere of Hong Kong changed. I too changed, as did the placement of the Queen’s portrait, and the British lilt of those isles. Some of the old wildness seemed to be tamer, but other things took its place. The Fragrant Harbour: it’s still one of my favorite places to be, and to explore. And, so far, I’ve only seen a fraction of those 261 islands. Harbour view, Hong Kong, 1992. Photograph by Lois Conner. Ho Tung Gardens 何東花園 (Hiu Kok Yuen 曉覺園), 2008. Lois Conner. Ho Tung Gardens, panorama, 2008. Photograph by Lois Conner. View from the roof of the Peninsula Hotel, Hong Kong, 1991. Photograph by Lois Conner. Kai Tak Airport, 1993. Photograph by Lois Conner. Bank of China, 2002. Photograph by Lois Conner. Hong Kong, 2010. Photograph by Lois Conner. Wanchai, 1991. Photograph by Lois Conner. Hong Kong, 2009. Photograph by Lois Conner. Hong Kong, 1991. Photograph by Lois Conner. Admiralty, 1991. Photograph by Lois Conner. Wangchai, 2001. Photograph by Lois Conner. Ho Tung Gardens, 2001. Photograph by Lois Conner. Office, Hong Kong, 2009. Photograph by Lois Conner. Central, Hong Kong, 1992. Photograph by Lois Conner. Sir David Tang’s Hong Kong office, 2009. Photograph by Lois Conner. Ho Tung Gardens, Hong Kong. Photograph by Lois Conner, 2001. Central, 1991, Photograph by Lois Conner.